Wie geht es jetzt weiter????? Wie krieg ich, zum Beispiel, die Seilwinde ab? Welche Schritte muß ich dazu einleiten? Your site looks "f*cking great", but I can't understand anything. Are you going to be translating it into English? Also, do you give tours? 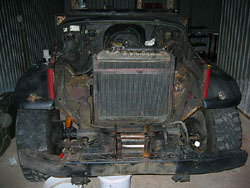 I am planning a trip to Germany next month and would like to see what a disassembled LandCruiser looks like in person. Hi Jon, great to hear from you this way. Well, actually I think it qould be coold to translate the site, but I think, then I can finally say Goodbye to my girlfriend... If you try hard and dig out your old german, maybe you will get into it anyway. you are coming to germany? do I organize tours? for you I will, of course, including a couple of beers. maybe you want to send the details of your trip to my email-adress: info@landcruiser-experiment.com. I will check, weather there are some parts that are more easy to get in the States and that are not too heavy or big to take with you in the plane. anyway, send me an email!